Francis House were delighted to receive our 86 chicks when I delivered them. Their office was a sight for sore eyes I can tell you with over 8,000 chicks waiting. Thank you so much for your time helping this worthwhile cause. Did you know that you can have a look at each month's minutes on our website? If you've missed a meeting or two or can't remember something, that's a good place to start and Pauline writes in fabulous detail. At our last meeting, we had great fun with icing and sparkly bits making shoes with various levels of accomplishment. Dee was a fabulous instructor and we are very lucky that she'll think of something new each time. What next? This month, Dave Walker, a local vet, will be telling us about his job and the animals he has encountered along the way. What a busy month we have had - we have been bowling again organised by Dee - we've a few really good players; we've listened intently at the Annual Council Meeting - I even asked a question about elasticated trousers and SAGA holidays! We had two fantastic evenings rifle shooting - beware of Dee, Margaret, Pat, Liz, Helen, Justine and Iris our star shooters. We saw Starlight Express and I loved it so much that I took the family for a second time (amazing job Pat P ). We enjoyed a fabulous visit to the Pankhurst Centre and Elizabeth Gaskell House and loved the experience. We had the privilege to meet Dr Helen Pankhurst, the great-granddaughter of Emmeline Pankhurst on a flying visit from her home in Ethiopia. What a surprise that was. Thank you Jane for your meticulous organisation. We also baked a lovely array of cakes to support Wells for Africa raising over £300, thank you so much for your generosity. Thank you in advance for your knitted bonding squares - apparently I caused quite a stir as I knitted my way through the Annual Council Meeting! And finally, we will be picking a lucky winner for our first bursary of the year. We have some lovely entries. 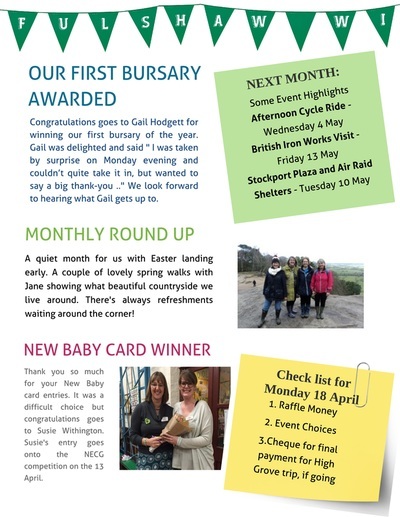 We will also be choosing our winning "New Baby" card which will go toward the North East Cheshire Group competition. Please don't be shy entering as we have a prize for our own favourite. We look forward to seeing you on Monday. I can't wait to see what lovely cakes are on offer! Please let me know if you cannot read any of the attachments. Friday16.9.16 - Sunday 18/9/16: Tenth Anniversary Two Nights Weekend Away in the Ceiriog Valley (Oswestry) - Non returnable deposit required £40 . Limited spaces . Total cost approx £80 to include food, shared petrol costs, Fulshaw led activities including walks, craft etc. http://www.springhillfarm.co.uk.. Contact fulshawwi@yahoo.co.uk for further information or to reserve a place. Wednesday 13/4/2016: Spring Meeting - Graham Walton - My Life with Seven Women (father of the famous Liverpool sextuplets - 7.00pm for 7.30pm. Tickets £5 includes Tea/Coffee and Cake - North East Cheshire Group - Woodford Community Centre. Contact Sheila Parker - sparker0901@aol.com or Amanda Stevens - amanda@garryolson.co.uk. Tickets need to be booked at the March meeting if you would like to attend. Did anyone watch the Hidden and Homeless programme last week on BBC3? The charity we supported with our sanitary products Coffee 4 Craig and The Wellspring in Stockport were featured and made very interesting viewing and is available on iPlayer. It's lovely to hear that you have tried your hand at the little knitted chicks for Francis House and that they will be swimming along to our next meeting. Also, please bring any breasts that you've managed to make so that they can be off to South Africa this month - my son thought they were babies hats or onions! 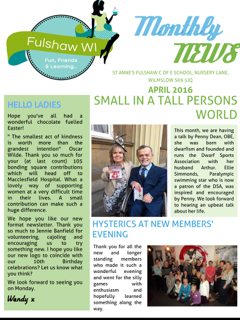 We are absolutely thrilled to welcome more new members this month. Over the coming months we will hopefully be welcoming more ladies who wish to visit us to see what we get up to. Please welcome with a smile as usual. At our last meeting, we welcomed Jan Bloor who talked us through Mindfulness. Did you all feel the calmness in the room? Wasn't it wonderful to hear Tom snuffling and our resident Hearing Dog chewing her bone whilst we attempted to concentrate on the breath! Our social time was so lovely and the array of cakes were mouth watering. This month, we are very excited to welcome Sweet Temptation who will be showing us how to transform a cupcake into a shoe! It should be a lovely time for creating our own designs and lovely chatter as we get to know each other more. Please bring along a container approximately 6" square to take your goodies home. Talking about that, we had a lovely evening at the Italian Lab and heard Pat's hilarious story of her impulsive trip alone to Portugal and another Pat dropping into conversation that she worked on Woman's Hour! We also laughed and cried at The Girls, listened intently to the mysteries of makeup during the 17th Century including using urine and faeces - delightful, we coloured postcards, discussed our latest book, crafted green hearts for the Climate Coalition at The Heatons and had a couple of walks. Thank you to everyone who has suggested, supported and organised events. Please keep your ideas coming. Our Events Table continues to be popular and is as busy as ever with more offerings each month (list attached). Dee and her team of secret shoppers have chosen a lovely selection of raffle prizes for us yet again this month. Our Bra Bin will make a welcome return so please bring any old bras you've have lurking in your cupboards! We are also very excited to offer our Birthday Weekend away - it promises to be a great time and our team of organisers are busy putting a great event together. It has been booked and deposits of £40pp are required to secure your place. Places are limited to 36 ladies and car sharing will be offered wherever possible. And finally, we are looking for entries for the first of one of our Fulshaw Bursaries this year - up to £150 to be given in March to a renewing member. It's can be local or towards Denman (the WI college) for something educational - this can be wide ranging. Please send us an email before the 14th March with what you would like to do, course details (which must be taken before the end of the year) and why and we will put it in our hat at the March meeting for picking. All we ask is that you tell us about it once you have completed it. Happy thinking. We look forward to seeing you on Monday and for those who can't make it, as I know of a few exiting trips being taken - have a wonderful month. Please let me know if you cannot read any of the attachments. 1. Bras, Breasts and Chicks! Welcome to a brand new year and I hope that it's going to be a fabulous one for you all. I hope you had a lovely festive break with family, friends or as one of my friends did - sat in bed alone drinking champagne enjoying the peace! I'm afraid the floods scuppered some of my plans meaning that we were cut off from my mum so we were able to enjoy Christmas two weeks late instead. I am sure we have thought about those people who have been affected by the floods over the past few weeks. Many who are WI members around the country and other members who have been volunteering to get their communities back up and running after such a cruel turn of events. It should have been a magical time of the year. Welcome again and thank you to all those members who enrolled for another year at the Christmas party and eased Jennie's job this month. We were absolutely thrilled. This month will be the final month to guarantee your space and we would therefore appreciate anyone letting us know if they no longer wish to renew. I am truly sorry to see some of our members not renewing due to family commitments as more and more ladies become part of the so called "sandwich generation" - I wish them all the best and hope they will come back to us when things change. If you send your cheque to Jennie to arrive before the next meeting the refreshment fee will be waived. Let me know if you need her address. All members who have done this already will enjoy no charge this month. This month we will be welcoming several new members from our waiting list together with a few visitors - with this in mind I'll repeat that photos, write ups etc. can be seen on our website and Facebook. Minutes of each meeting are also on the website. As always, Pauline our Secretary and Sheila and Jennie our online stars do a great job of keeping everything up to date for you. No need to be on Facebook just go to the website and click on the Facebook sign and you can take a peak without ever having to register. Our Christmas Party was an absolute hoot and I must say that the care and attention from the committee and our helpers was meticulous. Thank you to them and thank you for those people who took the time to email or speak to us to let us know how much you enjoyed yourselves. It really meant a huge amount but the greatest satisfaction was seeing all of you with smiles on your faces and laughter in your hearts. It was a great evening. At our next meeting, on the 18th January, we welcome Janet Bloor who will be showing us how mindfulness can help us 'tune into' our minds, thoughts, emotions and feelings. This is said to be able to help us have greater control over the way we respond to life's challenges and achieve more harmony and contentment. A great way to start the year! Our Events Table will be open (list attached), the superb raffle will be back and fizz and cake will make its usual appearance. If anyone has any gifts which you feel may need a different home please feel free to donate to our raffle. The WI Life magazine gave us a list of possible resolutions in December which will be voted for at the January meeting. A list is attached for you to decide. If you are not coming to the meeting and want your say please email your vote. And finally I am pleased to announce that our member Susie gave birth to Thomas safely on the 21st December making our member Iris a grandma again. We wish the family all the best. See you all very soon and thank you for taking the time to read allowing us to have less business time at the meeting. Please let me know if you cannot read the attachments. I love this quote from Lady Denman - "All members are responsible for their WI, not just a couple of super women" - Fulshaw is full of super women. Firstly breaking news - we received third place in the Christmas Festival. Well done everyone. I am immensely proud of everyone of you who contributed to our entry. This month our members have enjoyed afternoon tea at the Clink, entered the Christmas Tree festival, been ten pin bowling and visited the lovely Trentham Gardens. TONIGHT we will be enjoying Gareth Malone at the Bridgewater Hall and TOMORROW we will attending the NECG Carol Service at 2pm at All Saints Church, Cheadle Hulme - family and friends are welcome. Photos, write ups etc. can be seen on our website and Facebook. Minutes of each meeting are also on the website. Pauline does a fabulous job of really capturing the essence of each meeting and if you miss one its a great way to catch up with events. Our November AGM was really well attended. Thank you to your continued support and for voting me back in as your President. I do it with pleasure but I couldn't do it without everyone of you - your help and guidance is so much appreciated. Congratulations to Jess, Dot, Alison and Jane for being our successful biscuiteers (recipes on the website) and thank you to all twenty nine entrants showing what a talented lot you are. Our Christmas Tree was just beautiful adorned by lots of lovely homemade decorations. The Members Makers Market was a triumph and thanks goes to the stall holders big and small who showed their amazing talents and contributed to the raffle prizes. The buzz was great. And lastly, thank you to the lovely ladies who produced some fantastic cakes and served us with well needed drinks and our Book Ladies for this great initiative. Our next meeting is the Hoe Down at the Wilmslow URC starting at 7.30. Ticketed entrance. No dress code as anything goes but bring your dancing shoes. Lots going on including a quiz, spot prizes, food and drink. We have approximately eighteen fabulous hampers which every single item has been donated by you - thank you - we were astounded at the quality of gifts. We have our usual Secret Santa - think what you would like to receive. It's going to be FUN FUN FUN and no business so we can all let our hair down. We will have our sparkly Renewals Box for cheques at the front desk. I've heard from a few of our ladies who are unable to renew and I wish them all the best for the future and thank you so much for your support and contribution over the years. Thank you for letting us know and a massive goodbye from your friends at Fulshaw. The WI Life magazine has given us a list of possible resolutions. Our votes need to be in just after our February meeting. If you feel strongly about any of the categories please let me know. It would be great to spare a few minutes to discuss this matter. Let me know if you are unsure what they are. And finally, Diane Atkinson has let me know Lidl are selling sewing machines again, from today at £69.99. A few ladies were interested when we made the Morsbags. Other sewing machines are available at other stores! Looking forward to seeing you all either tonight, tomorrow, at the next meeting on Monday December the 14th or if I don't see you there have a fabulous Christmas and New Year and hopefully see you in 2016. Firstly, can I say congratulations to Wilmslow for the fabulous results for Britain In Bloom. Our Centenary Garden helped in the community section for them to attain the Best Community Effort award. All our events are attached and in our new format with additional information following some very useful feedback. This month our members have enjoyed a lovely walk, great conversation at our book club, the NECG Centenary Dinner, a trip to the theatre to see 'Beryl' and had the privilege to have a Q&A with the cast and the writer Maxine Peake, the cinema to see 'Suffragette' again with 89 Greater Manchester WIers, a visit to Chester to attend WITea training and Diane even went indoor rock climbing this weekend with other WI members. TODAY, we will be supporting our local theatre to watch "Sister Act". Photos, write ups etc. can be seen on our website and Facebook. Our October meeting brought David Mooney and his Vimmy Duck - despite some equipment failure he gave a good account of his work and gave us a hint or two to enhance our cooking. Our cakes were amazing and thank you to all the ladies who baked at the last minute due to cancellation of helpers due to unforeseen circumstances. Hilly even sent her famous shortbread despite not being able to make the meeting. It really was appreciated. Jean did a roaring trade in books and people seemed to enjoy the cookery book swap. We still need lots of hamper donations from you so that we can make up our wonderful selection of hamper prizes for the Christmas party evening. The more we have, the more prizes we can offer. Please bring them along to the meeting on Monday. Our next meeting is the AGM (no entry charge this month but you need to sign in as normal). Please do come along and share in the celebration of such a great year. We aim to get through the formalities so that we can enjoy the Biscathon, however it will be a chance to reflect on the year past. As a fun thing to do, many of you have so far volunteered to put your biscuits to the test. To enter the Biscathon, you need to bring mini biscuits made from a usual batch or biscuits quartered to the AGM. They can be either sweet or savoury but should not have any toppings or butter on them. If you would like to enter and have not already signed up or have any question please contact Lorna Davy. (Lakeland vouchers will be awarded to the winner and second place of each category and voting will be carried out by everyone on the night. Good luck! We will also be having a Members Makers Market with our lovely members volunteering to show just how clever they can be. Many are not in business selling their products so it would be great to dig deep to support them and maybe get a present or two. I am sure you will be impressed at the array of talent. Also, due to catering we would like to ask you to pre-book your place again at our Hoe Down Christmas Party with live band. Dancing is not compulsory and we will still have lots going on. It will be on the 14th December at 7.30pm at Wilmslow URC. Tickets will remain at £5 and this includes a free raffle ticket, a hot pot supper and some delicious desserts, a glass of wine with your meal (feel free to BYO) plus spot prizes, a table quiz, secret Santa and some other surprises. Please bring your money along on Monday or email me to secure your place by the 30th November. Dietary requirements can be catered for - just let Jennie know when you buy the ticket. Please remember to bring your Christmas Tree decorations - you can see our display so far on the Christmas Tree. It's still not too late to do some craft in white, blue or silver. Let's make our entry spectacular. Our list of speakers for 2016 is on the website if you want to have a look and we have lots planned for the coming months including one bursary in February to be awarded to one renewing member, craft and painting workshops and a craft project for the school celebrating their 140th year to name a few. A separate email will be sent with details of renewal. And finally, the PressXpress (the iron we tested) is currently on promotion in Sainsburys (and they’re running a double nectar card points event too) – so if any of you wanted a new iron that's highly recommended look no further. In addition, we have been approached to do other product testing in the New Year. Watch this space as once again limited numbers will be available but it would be lovely to involve even more ladies. Looking forward to seeing you all either at the next meeting on Monday November 16th or at one of our get togethers. You continued support is very much appreciated. All our events are attached and in our new format - have a look and see what you think. This month we enjoyed an outing to Gothic for Girls with the very talented Lucy Adlington from History Wardrobe, a NECG walk to Dunham, a Macmillan coffee morning, a cross federation picnic in Heaton Park, a day of making Morsbags for Food Friend, Sheila entered the Cardiff Half Marathon as part of the WI National team, we saw Anne Diamond at the Autumn Council Meeting in Winsford and had our long awaited trip to Roberts Bakery (I can still smell the baking!) and a a group of us went to see Suffragette. Its been a fun packed week and its been great to see so many people out and about. Photos, write ups etc. can be seen on our website and Facebook. Don't forget we are cycling tomorrow for about 15 miles from Twinnies Bridge Car Park with refreshments at the Airport Visitors Centre. We will leave at 9.30am with an approximate return at 1.30pm. September came and went with a wonderful celebration of the WI's Centenary. The cake was delicious - huge thanks to Dee and I enjoyed our rendition of Jerusalem. We opened up our doors to ten visitors and we have had great feedback about our friendly, welcoming atmosphere. I am so proud that we continue to get these positive comments. It's how I felt when I joined and it's wonderful to feel it in the room. Thank you to Liz and Jean for starting their book library. I picked one up which I am enjoying reading. Please come and have a look and borrow a book or two and support this new initiative. It's work like a library so no swapping of books is necessary. Also thank you so much for the 102 sanitary items and a huge amount of gorgeous toiletry gift bags donated by Lorna that you very kindly donated. Coffee4Craig were delighted and overwhelmed to receive them on behalf of ladies who are homeless or in dire circumstances. Yes 102 - when I counted them I realised what a massive undertaking I had set so a huge thank you. This month, David Mooney, Co-owner and Chef Patron of the New Moon Pub Co, will be giving us a cookery demo as well as chatting about his 32 years in the catering industry including his time working with Marco Pierre White and Raymond Blanc. This will be our last speaker for the year as we have our AGM and Christmas Party to look forward to. Its also your opportunity to swap cookery books. Have you got duplicate books, chefs that you don't care for or even just fancy a change. Well now's you chance to swap away. Any unclaimed books will be sent to a local charity. As in previous years, we are having our usual Christmas Hamper extravaganza. Would you please bring any donations you have this month and next? We try to have many many hampers for the free raffle, I think we had over 20 last year and we would like to do the same this year. Lorna will be announcing the AGM's "Great Fulshaw Bake Off" and our entry into the Wilmslow Christmas Tree Festival. We will be looking for people who will enter baking and supply decorations. The actual details will be announced at the meeting so don't get your aprons on or your knitting needles out just yet! And finally, Jennie our Treasurer, Pauline our Secretary and myself have all expressed an interest in standing for election for another year. Please let me know if you wish to also be put forward for any of these positions. In addition, the current committee have offered themselves for re-election. If anyone wishes to be considered to be elected onto the committee please let me know within the next month. I am more than happy to discuss what's involved but can assure you that cake and laughter have a place in the proceedings! If you are more interested in just helping out and committing the odd hour or two just let me know. Looking forward to seeing you all either at the next meeting on Monday 19th or at one of our get togethers. Despite it being our month off, we have had the chance to socialise, talk about our latest fantastic book, walk, cycle, enter the Alderley Edge Village Show and of course enjoy our brilliant trip to Harrogate when we saw many of our members loving the Centennial Fair. I am officially quite a few pounds lighter - unfortunately not the pounds I wanted to shed! Before the next meeting five of us will celebrate 100 years of the WI by joining 45 other members from across the region and 'flying' for 100 minutes in total. We will have also officially opened our Centenary Garden. Its on the 16th September at 10am if you fancy coming down and having some cake. Please also go and have a look at other times and maybe pull a weed or two - it's on the corner of Arlington Way - the more the merrier can get involved. This week (Thursday) we have a lovely morning walk leaving at 10.15am from Twinnies Bridge Car Park. Anyone is welcome so bring friends and partners. If you would email Jane at rawfam@ntlworld.com to let her know you would like to join us so we can wait for you in case of any delays. Photos, write ups etc. can be seen on our website and Facebook. If you interested in having a little training on Facebook please let me know. It may open up an opportunity to keep in touch with family, friends and your local community whilst maintaining your privacy if you wish to do so. Doesn't our July meeting feel so far away now? As September is here we can look forward to hearing from John and Sandra Horsman who will be giving us an illustrated talk about their work with puppets and The Marionette Theatre Company. We will have lots of visitors this month as this may well be the last open meeting of the year. I am sure you will make them more than welcome and as they are from the local community I am sure you may know many of them. This month's visitors list is now closed. We will be having a bit of a celebration with birthday cake made and decorated by Dee, great raffle prizes (don't we always!) and a few surprises. This month is another of our "100 Things to Do in the Centenary Year" - we will be collecting sanitary products for the homeless and those in refuge from domestic violence. Please bring along sanitary towels, tampons and other related products - we want to aim for at least one hundred items! We would happily accept any fabric that you may think suitable for our bag challenge - "100 bags for 100 years of the WI". Amanda has been beavering away making a start and they look gorgeous. The challenge is to support the environment by reducing plastic bags use and recycling fabrics so any donations would be great. We are giving the bags to Wilmslow Food Band to distribute food to the local people instead of using plastic bags which they will have to buy after the 5th October. We think that this will be a brilliant way to get the bags to those who need them in our local community. Our favourite 5 bags or so will be auctioned off at the AGM - money will buy food for the Food Bank. There will be packs available to take home if you can't make the date and Jennie has offered to hold a "making evening" for anyone who may want to make one but wants guidance. I hope you enjoyed your secret book for reading during the holidays? This month Liz Moss and Jean Hill who are keen members of our Book Club will be bringing a selection of books available to borrow. Please support the ladies in their efforts. If anyone is a keen photographer and is willing to take some great shots of our meetings especially this next one I would be very grateful. I have ordered a few WI Life magazines for those people who may not have received a copy. Our MCS (WI's data base) needs to be kept up to date with changes of addresses - I can check the correct information is on it. If you haven't please let me know and I can reserve one for you. And finally, we are introducing some additional chairs at the front which are not full size but may be more comfortable than the benches. If you have a small bottom and would like to test them out we would be grateful! We are working hard to find solutions and a lot is going on behind the scenes to try and get the best outcome. Once again any suggestions are gratefully received. Can you believe that we have had the longest day already? Summer holidays are almost upon us. Our summer break in August is fast approaching and the committee and all our helpers get a well-deserved rest. It is really appreciated if you spend a little moment or two whilst sipping a beverage looking through this information – its reduces the amount of business we need to get through whilst I attempt to keep you up-to-date. Yet again the month has been awash with events. We appeared in the Wilmslow Guardian and wilmslow.co.uk promoting our wonderful branch. Several members attended the Row of Trees Centenary Garden Party supporting our neighbours. Following on with the party theme, we had a super time at Gawsworth to celebrate the 95th Birthday of the Cheshire Federation and afternoon tea at Wilmslow High School - the pupils were amazing. I attended a Presidents Dinner, meeting some of our neighbouring Presidents including Hale and Great Moor to name a couple. Our legs ached after a great bike ride to Jodrell Bank with Jane - amazing weather and lovely food and another bike ride in the evening to ensure that all that food stays off the hips. We had a trip to Llandudno which was a great success and the weather was incredibly kind too. Philippa and I ventured on the cable car and others went on the tram to the Great Orme. There was even an altercation with a seagull over an ice-cream! We had our Book Club which as always, was a fun event full of laughter and camaraderie in spite of the last book getting mixed reviews - thank you Liz for leading. A group of us attended a focus group testing out irons – three ladies irons were deemed extremely dangerous! And finally, our Centenary Garden in collaboration with Incredible Edible has been started on the corner of Arlington Way. Thank you Jennie for masterminding it. Well, I thought May's meeting was good but June's turned out to be emotional and thought provoking. Alexandra, Custodial Manager from Styal Women’s prison, gave us a very absorbing and immensely interesting talk about how the prison is run, covering every aspect of the lives of the female prisoners. Libby spoke eloquently about her job and training within the Clink and how this had affected her self-esteem and family life. I can't thank you enough for the vast amount of clothing we collected which I am sure will make a huge difference to the ladies. If you want to read a full account of the meeting Pauline has done a fantastic job on the Meeting Record which are on the website or in the folder at each meeting. Alison gave us a lovely run through of her experience at Buckingham Palace. The fact that she ended up at the St Pancras Champagne Bar afterwards gave us all a chuckle. She had a delightful experience. We had six visitors including two ladies from Hough & District who gave this wonderful feedback: "We would also like to say we felt very welcomed and had a lovely warm and fun feeling at your WI. Please pass on our sincere thanks to all your members for such a wonderful memorable evening". ﻿Cathy, Jan and Dot gave us a delicious array of cakes and one of our newer re-joined members, Jennie Banfield provided us with some savoury snacks as a trial. Thank you ladies for your help and assistance on the night. We are still working on the queues and tweaking things here and there. Also, we continue to need to use the benches - if you are happy to sit on benches and give way to members who would prefer a chair, it would be helpful. We are continually monitoring and assessing the situation and looking at other possibilities including moving to another venue locally, using smaller chairs and rejigging the room again. I welcome your feedback and any suggestions you may have. This month we need tables so benches will not be required. Please do look at our website where all our future activities, minutes and details of past events are detailed and are kept up to date. If you fancy dipping into Facebook you will get up to the minute news and photos. Please ask if you want any help setting it up - it’s very easy and you can keep your data very secure. We are just 9 likes off the Centenary! And finally, don't forget to bring a wrapped second hand book for swapping to give us a surprise summer read! Wendy x ============================================================================================================================================================================================= Here are a few events for your Calendar. Payment should be made when you put your name down but if you need to budget please let the ladies know. All events are for ladies only unless specified. I hope I haven’t forgotten anything. Hilly has been able to secure an evening of kayaking on the Thursday 16th July . We will need to meet at the Adelphi Mill in Bollington at 6.40pm or car share may be available. It’s always a great evening and a really great chance to switch off and enjoy the peace and tranquility other than the giggling of course! £8 - bring a friend. Don’t worry if you haven’t done it before. Please email me so there are enough instructors in place. The Little Black Dress - an inspiring story of how one competition brought a Lancashire WI group together also stalls, raffle and drama sketch– Friday 18th September at 7pm – Cheadle & Gatley WI, Cheadle Social Club, SK8 1BQ - £5 includes a drink. Making 100 Morsbags for the Centenary for distribution: Drop in between 10.00 – 4.00pm on Saturday 3rd October. Sewers, Cutters and Encouragers welcome! Tea, coffee and cakes on the day provided. Venue to be confirmed. Put your name down to show interest. CFWI scrabble tournament: Tarvin Community Centre on Monday 21st September (this is our meeting date) at 7.00pm & please bring a scrabble board with you. 2 games of 55 minutes each with standard Scrabble rules. Fee £4 per player closing date to register Thursday 10th September. CFWI dominoes singles tournament: Tarvin Community centre Monday 21st September (this is our meeting date) at 7.00pm. Please bring your own dominoes. Fee £4 per player closing date Thursday September 10th. Annual Golf Day – Friday 25th September at Hartford Golf Club. Cost £19 inc 18 holes and refreshments. Apply by 1st Aug with handicap. We have one lady so far. Autumn Council Meeting – Tuesday 6th October - £12 – this is a full day meeting from about 10 – 3. Guest Speaker Anne Diamond. Closing date for applications will be at the July meeting. Fashion, Facts, Fizz & Fun Celebrating 100 Year of the WI – Thursday 22nd October at 7.30pm at the Winsford Academy - £7 to include fizz or soft drink. Closing date will be the July meeting for applications. WI show in Harrogate. 3-6th Sept. Looks like it may be a fabulous event. Fulshaw will be putting on a coach for Friday 4th September. Tickets are £11.50 including the coach provided by Fulshaw for a Fulshaw WI Member. Spaces may be available for family and friends once we have numbers at a cost of £23.75 for adults. £21.50 other WI’s. Approximately four tickets left and available to friends and family. Great to see that summer is arriving, all be it in fits and starts, but I know the holiday season is upon us too – if you have been away, I hope you have had a good time. Please take some time over the next few days to read what's going on as it reduces the amount of business I have to tell you about at the meeting, which must be a good thing. This month on my travels I visited Adlington and Didsbury WI's and what a pleasure it was too and both completely different. Alison went to Buckingham Palace for afternoon tea and she has agreed to tell us all about her fabulous experience. Amanda and Sheila attended the NECG meeting and a group of us attended the live transmission of the AGM at the Imperial War Museum but more of that later. Last month’s meeting was absolutely superb. Matthew Stagg from Buxton Mountain Rescue gave us an amazing insight in this valuable service and opened our eyes to the unsung heroes that are available at a moment’s notice to rescue the unwary and unlucky......food for thought indeed! Our “flowers” competition was well supported with 23 entries – Barbara Death and Jackie Rabone were our lucky winners of appropriately enough, a bouquet of flowers! Thank you for everyone who took part and I was astounded at the quality and ingenuity of the entrants. Many of our new members attended the meeting and it was lovely to see great smiles and conversation around the room with both the new and older members (in membership terms). Welcome. The cakes were delicious once again and the refreshment team did a brilliant job. We had just two visitors this month which was a far cry from the month before. The queues were kept to a minimum but our waiting list has grown for 2016! We had sad news of the impending departure of two of our members. It will be Barbara McCullough’s last meeting this month as she will be moving to York to be with her family. Barbara has been with us since 2008 and has been our Secretary and a valued member of our branch. Also, Janice Sims may be leaving in July if all goes to plan to move to Dartmouth. One of our newer members who has made a great impression, she has been a keen member of the book club and we have enjoyed the stories of her travels and need we say any more about her famous scones! We wish the ladies all the luck in the world and hope you will be very happy. Please come back and visit us if you are ever in the area. This month we will be welcoming a custodian from Styal Prison who will talk to us about life at Styal, including the new gardening initiative and the Clink Restaurant which is now open to the public. We will be collecting good quality clothing in a full range of sizes. Please see attached for guidelines. Yet again our activities have been plentiful – we had the NECG walk forging friendship with other WI’s, a bike ride around the Cheshire countryside and a great evening supporting the community charity Chifundo. Also, it was lovely to see ladies around the town during the Art Trail event including those in the kitchen offering refreshments and Hilly displaying her beautiful ceramic pieces. The NFWI General Meeting streaming at the Imperial War Museum was a great spectacle with eleven WI's represented and we actually appeared live on screen at the Royal Albert Hall! We were one of only three streams which included Devon and Llanfair PG and it was a real honour. If you haven't heard there were three fabulous speakers, the Queen, the Princess Royal and the Countess of Wessex visited and there a motion to pass over the resolution vote which attained the three quarters majority needed. This means at the moment we have no Resolution. I must say that Janice Langley, our current National Chair, did a sterling job and kept it very up beat in spite of it being a bit of a disappointment. The full day is available on YouTube through our website if you fancy dipping in and out of it. Lucy Worsley was great - look out for her documentary about the WI on the BBC later in the month called "Cake Bakers and Trouble Makers"! TONIGHT, we have Orienteering led by Kate and Dave Bryant. Please come along for a great night out with a difference and on Wednesday 10th June we have a walk led by our intrepid Jane from the Lindow Common Car Park at 12.30 with refreshments at Morley Green café – 4.5 miles. Amanda held the Committee Meeting and produced some scrummy desserts. We had lots to talk about including our speakers list for next year which is almost finalised, Centenary celebrations and events, reviewed our last meeting and half yearly accounts . We really do pack things in but it really is great fun too. Here are a few events for your Calendar. Payment should be made when you put your name down but if you need to budget please let the ladies know. All events are for ladies only unless specified. TONIGHT A fabulous evening of Orienteering once again organised especially for Fulshaw by Kate and Dave Bryant – Tuesday 9th June – Starting time 6.30 – 7.00pm at The Old Dancer. Food will be available up to 9pm. We had a hilarious evening of fun last year. NO running shoes necessary as it’s a lovely walk at your own pace. Book Club – Thursday 9th July at the Riflemans. Our next book is Nora Webster by Colm Toibin. An evening at EGO restaurant in Bramhall on Monday 13th July - £20 inc. two courses, bottle of wine (which can be taken home) and tip. See attached menu. History Wardrobe present: A Dress for Every Decade in Celebration of 100 years of the WI – guaranteed to be wonderful evening. Tuesday 14th July, 7.30pm – Amazing value based on the cost of the speaker! - being held by Social Lites WI - £5 inc Tea/coffee & cake – Flixton Girls School – M41 5DR – Car Sharing Available going from Wilmslow and Bramhall areas - please let us know if you need / can offer lifts. NE Cheshire Group - Summer Walk on Wednesday 15th July – 1 ¼ hour walk plus supper. Meet 7pm Legh Arms. Notice of the next CFWI county visit to Denman on 22nd to 24th July 2016. Cookery, music making, walking, craft and heritage courses on offer. There are 84 places £330 inc transport, however, certain materials will be extra. and 2 x£200 bursaries are on offer. A ballot will be held if more than 84 members apply. Please notify us if you are interested in going by September 11th? WI show in Harrogate. 3-6th Sept. Looks like it may be a fabulous event. Fulshaw will be putting on a coach for Friday 4th September. Tickets are £11.50 including the coach provided by Fulshaw for a Fulshaw WI Member. Spaces may be available for family and friends once we have numbers other WI’s. Thank you so much if you attended the meeting on Monday and wasn't it a good one? I thought it was an amazing atmosphere and the feedback from the NECG ladies was very positive. They were amazed at our commitment to the local community and charities that our ladies support but also the friendliness towards members and visitors too. As a member, committee member and now President I continue to be proud of being a part of Fulshaw. Anyway, I just wanted to clarify something - our next meeting we will be holding a competition in true WI style based around flowers. If you would like to enter it can be in any medium from a photograph, cross stitch, painting, model, ornament, quilling, paper craft, wood the list is endless. We are looking for members to take part whatever level or interest. Please do not be put off if you are not to Cheshire Show standard. This is just a starting point with a "have a go attitude" and we will have a couple of little prizes too. I am sure it will be lovely to see what a diverse bunch we are. Also, Rosemary will be helping out at this event and if you would like to go (my ticket is booked) please contact her. Looks like it could be a great event. Wednesday 20th May 7pm at the United Reformed Church, Wilmslow. Chifundo is a new charity created to empower girls and women in Malawi (Central East Africa) by funding them to study, for example on tailoring courses, teacher training and university courses. A group of about 30 women in Blantyre in Malawi help to raise money for training courses by designing, producing and selling sustainable fashion accessories and household products both in Malawi and here in the UK. They use recycled good quality denim and cotton. Proceeds from the evening will go to this charity for their work with women in Malawi. We are looking at ways to try and alleviate the queue at the door and we have had an excellent suggestion from a long established member. If anyone else has any suggestions I would be interested to hear? Don't forget our walk on Saturday in Knutsford starting at 11.30 - all are welcome. All those, who this month are going to "Stepping Out", "Raising Agents" and "Staircase House and the Hat Museum", Book Club and Afternoon Tea in Macclesfield have a wonderful time. If you didn't attend the meeting and still want to go for Afternoon Tea please contact me and I will let Dee know. Have a great month and as always thank you for your support. After the recent storms, it is lovely to see that we have some beautiful sunny weather to brush away the cobwebs of the darker months.I hope you all enjoyed Easter and didn’t overdo it. We had three Easter Eggs hunts in Wales which may have overdone it a bit! Last month’s meeting was an absolute corker. We welcomed two new members - Sarah Williamson and Kate Sibthorp . The Easter egg decorating was superb and gave us a great evening of a demonstration and hands on activities. It was a great event and a wonderful time to get to know other ladies better. The donations for Food Friend came rolling in. Kate Sibthorp gave a lovely talk about how the food bank has affected her family and Penny Bowker very kindly took the many bags to the church– we received a wonderful write up in the Wilmslow news – a copy with be available at the next meeting. Our surprised and delighted recipient of the Buckingham Palace ticket went to the wonderful Alison Boddington. Please remember to curtsy next time you see her! This month we will be welcoming Amanda Manson from Orderly Office and Home to gives us the tricks of the trade and encouragement on de-cluttering our homes. I certainly need it and also need the push to get on with it. It’s an ideal time to start by bringing more bras for our Bra Bank and looking at clothes we no longer wear that we can donate to the ladies at Styal Prison for our June meeting. Some of our ladies have encouraged their friends and colleagues to help us too - why not do the same? It’s been a mixed month of activities – we had a few more ladies learning the intricacies of the iPad with Diane Atkinson, our first bike ride with Jane was cancelled due to high winds resulting in a lovely afternoon tea and chat instead! We had a lovely Committee Meeting at Rosemary’s planning more events – I really am so grateful to our team for the fun and laughter that we have whilst doing such an amazing job. I am attending the Resolution meeting in Congleton today with the President of Didsbury WI and some of us will be going to the NECG’s (North East Cheshire Group) Spring Meeting at Woodford tomorrow – tickets available on the door if you would like to come. There is also a family and friends walk today at 12.30 starting at the Riflemans – great time to bring others along. Please think about attending as it’s a great opportunity to catch up with everyone and last year our families loved getting to know people from our WI life. Can I remind you of our walk at Tatton Park on the Saturday April 25th in aid of ACWW? If the weather holds out it could be a great event and again it will be lovely to meet family and friends whilst supporting a charity supported by the WI nationally. Also, Dee has arranged a lovely afternoon tea at Macclesfield College on the 13th May – we really don’t need an excuse do we and it would be lovely to support the young people in the area. We have lots of lovely events coming up which hopefully you will find something that interests you so please have a look. We would like to encourage community groups to come and speak for ten – fifteen minutes about their activities in the area. If you or you know of anyone who would like to do this please let me know? I am sure you will agree that Kate’s talk last month was very powerful and meant much more than reading a flyer. It is time to vote on the National Resolution and if anyone feels strongly either way and would like to say a few words then please contact me – if not if will be a simple show of hands. Please feel free to put forward any events or activities you feel you would like to be offered. I’ve had some great suggestions so watch this space. Also, if anyone could come up with ideas on celebrating the Centenary around September it would be great to hear from you – simple or extravagant - the more the merrier. I am pleased to say that I have already finished the Rosie Project our next book club book. It’s a great one so please read along with us even if you can’t attend the next meet up. If for any reason you need help getting to the meeting we are happy to try and coordinate transport. Please do not come due to this because we would love to see you. Looking forward to seeing you all on Monday. Here are a few events for your Calendar. Payment should be made when you put your name down but if you need to budget please let the ladies know. Centenary walk and family picnic for charity ACWW (Associated Country Women of the World) ‘Women Walk the World’ Tatton Park on Saturday 25th April starting at 11.30 at the Knutsford entrance. Suggested £2 donation. We will be inviting other local WI’s - Organisers Wendy and Sheila. Please put your name down if you are interested. Raising Agents – play to celebrate the WI Centenary - Bunnington WI is a bit down-at-heel. Dwindling membership means they can barely afford the hall, let alone a decent speaker. So when a PR guru becomes a member, the women are glad of new blood….. – Friday 8th May at 7.30. Tickets £10 Eccles Town Hall – car sharing available and free parking. All proceeds go to Salford Loaves & Fishes, a charity which provides services in a safe and secure environment for homeless and vunerable people. A lovely bike ride on Wednesday 20th May starting at the Riflemans at 12.30 meandering around the Cheshire countryside. On the day, there will be a live streaming of the Centenary broadcast at the Imperial War Museum, Manchester and tickets will cost £2 each and are very limited in number. The Centenary NFWI AGM will take place at the Royal Albert Hall - Thursday 4thJune between 10.30 – 4.30. Three fabulous speakers have been announced - Lucy Worsley, Helena Morrissey and Tanni Grey-Thompson. It will be great to be part of history and celebrate with other WI branches. Put your name down to secure a place. A lovely bike ride on Wednesday 24th June starting at the Riflemans at 10am meandering over to Jodrell Bank for lunch. Jane is asking for numbers for lunch please. NECG – Day trip to Llandudno by coach starting at 9.15 from Woodford and leaving Llandudno at 4.30 – Tuesday 30th June – Tickets £11 – this really is great value and it’s such a beautiful spot. Cheshire Show 2015 23 -24th June at Tabley. Refreshment stalls and stewarding to be manned by the WI. Car parking and free entry in return for time helping. Cheshire Federation of WIs: 95th Birthday celebrations at Gawsworth Hall, Wednesday 8th July from 12.30pm. Hall & grounds & tea room open – entertainment provided. Tickets £5 – we would like to send our request in by the May meeting to secure them. Invitation from the Bishop of Chester to a CFWI open day at the house of the Bishop on Wednesday 22nd July (11.0-1.00pm OR 2.00-4.00pm). Admission £5.00. Closing date 26th June. High Sheriff's Prize for Literature - short story (1500 words) prize £2,000 and £750. Closing date 1st September. Come all you writers. Notice of the next CFWI county visit to Denman on 22nd to 24th July 2016. Cookery, music making, walking, craft and heritage courses on offer. There are 84 places (cost not provided on form) and 2 x£200 bursaries are on offer. A ballot will be held if more than 84 members apply. Please notify us if you are interested in going. Tuesday 2nd June Buckingham Palace Garden Party – Alison Boddington will be Fulshaw’s representative. Members Open Day Wednesday 25th & Thursday 26th – NFWI HW in London – 11am – 1.15 & 2pm – 4.15pm. £5 per ticket if successful. 25 members each session which may be subject to a ballot. WI show in Harrogate. 3 - 6th Sept . Looks like it may be a fabulous event. Fulshaw will be putting on a coach for Friday 4th September . Tickets are £11.50 including the coach provided by Fulshaw for a Fulshaw WI Member. Once we have our own numbers finalised, spaces may be available for other WI members at a cost of £21.50 pp and family and friends at a cost of £23.75 for adults. I hope you all had a restful half term and have come back with some lovely stories about your adventures home or abroad. I spent a lovely evening with Mottram St Andrew WI last week. What lovely welcoming ladies they are. A great speaker, lovely refreshments and I was even in the winning quiz team! Pauline and I attended our first Annual Council Meeting in Winsford. A very interesting speaker, great WI traditions and a rousing rendition of Jerusalem. I have the Autumn meeti my diary already! It was lovely to meet Terry and June last month - that sounds like a 1970's sitcom! I think you will all agree that Paddy was the star of the show though. Also, I hope you felt the venue worked well but as always it's good to be coming home! No speaker this month as we are going to be enthralled by the mysteries of chocolate egg decorating led by Sweet Sensations. You only need to bring yourself. Our new members evening - with nearly 30 ladies - was a super event. There was lots of fun and great conversation plus some very silly games - who knew that two members have been in a wardrobe with someone famous. I hope we all know each other a little better and will be able to give a big smile when we see each other. I was left amazed at seeing Richard Gere as a pensioner on our trip to the cinema - still dreamy in my eyes! It's the first time that I have been to the cinema / meal deal and I'd recommend it - thank you Jennie to organising 18 ladies. Due to illness I went to see Bel Mooney and Ernie Rae without my WI friends but I was fortunate to meet others who had gone with their husbands and what a great evening that was. The canapés were a delight. Elaine Okleton was there helping out for a great cause and received some lovely flowers for appreciation. This Thursday, we are offered a lovely guided walk with Jane in the afternoon meeting at the Riflemans at 12.30 only to meet in the evening once again at the Riflemans at 7.30 to discuss our latest book which is Janice Langley's, the NFWI Chair's, favourite book. A bit of useless information there. Janice Sims will be leading us on this wonderful literary journey. I hope our 'Dabble Day' on Saturday will teach me new skills, use lots of our stash of buttons and enjoy a fabulous lunch catered by Dee and have some scintillating conversation and some great laughs. Thanks to the committee and Nicky Purdy-Jones and Kate Hopwood for helping organise it. A separate email will be sent out. I am so pleased that our members are coming forward with offers of help for one off events, catering or general setting up and putting away and speaker suggestions. You don't have to be an expert just a willingness to pass on a little knowledge, enthusiasm or information. Anne Kerr and Alison Hampson have done sterling work attending the North East Cheshire Group meetings for the last 18 months but are finding it increasingly difficult to attend on their busiest day. I am delighted to say that Amanda Stevens and Sheila Parker have agreed to take on this role. Lorna Davey has volunteered to act as New Members Coordinator so please seek her out if you have any questions and she will guide you in the right direction. Also, Helen Hopkins is taking over from Sheila Parker as Speaker Coordinator so if you have any great speakers please find her - this leaves Sheila to concentrate on our new fabulous website which is close to being officially unveiled. We are definitely open to supporting our local and wider community in our own way so this month we will be collecting for Food Friend, the Wilmslow based charity, that supplies families in difficulties with food and support. Could you please bring a contribution to the next meeting? Buy one get one free offers are always useful! Last months bra bin collected 108 bras - that's 226 so far. We will still be collecting each month so keep them coming . Also, we are baking for Wells for Africa this Saturday so contributions will be happily received if you want to get the baking tins out! If you are delivering to Jennie could she have them by Friday before 7.30pm. I can provide the address if need be. And finally, I hope you all received my separate email about the Royal Garden Party. Who is going to be our lucky member? Gail Hodgett will be manning the desk if you want to put your name in the hat! All the best and hopefully see you at the next meeting or future events. 2. Our first bike ride of the year must mean summer is on its way! Wednesday 1st April at 12.30 meeting at the Kings Arms, Alderley Road, Wilmslow, SK9 1PZ. Where will Jane take us this time? Don’t worry we will have evening ones too. 3. On Tuesday 14th April we have another walk starting from the Riflemans at 12.30 lead by Jane Rawlings. 4. North East Cheshire Group Spring Meeting is on Wednesday 15th April at Woodford Community Centre. Tickets cost £5 including refreshments and the time is 7pm for 7.30pm. The Speaker is Lydia Slack and the talk is entitled 'That Awkward Age' - a humorous and heart warming account of growing up surrounded by hills, animals and not many people! 5. Centenary walk and family picnic for charity ACWW (Associated Country Women of the World) ‘Women Walk the World’ Tatton Park on Saturday 25th April. Suggested £2 donation. We will be inviting other local WI’s - Organisers Wendy and Sheila. Please put your name down if you are interested. 7. A lovely bike ride on Wednesday 20th May starting at the Riflemans at 12.30 meandering around the Cheshire countryside. 8. Adlington WI has secured Cinemac in Macclesfield for just £5 for the live streaming of the Centenary broadcast at the Royal Albert Hall - Thursday 4thJune between 10.30 – 4.30pm. Three fabulous speakers have been announced - Lucy Worsley, Helena Morrissey and Tanni Grey-Thompson. It will be great to be part of history and celebrate with other WI branches. Put your name down to secure a place. 1. Cheshire Show 2015 23 -24th June at Tabley. Entries requested from all WIs for craft and cookery competitions etc. Entries to be in by 10th April. Refreshment stalls and stewarding to be manned by the WI. Car parking and free entry in return for time helping. 2. Cheshire federation of WIs: 95th Birthday celebrations at Gawsworth Hall, Wednesday 8th July from12.30pm. Hall & grounds & tea room open. WI members to perform (if they have volunteered already). Notice for request for tickets to follow. 3. High Sheriff's Prize for Literature - short story (1500 words) prize £2,000 and £750 Closing date 1st September. Come all you writers. 2 . Advance notice of the WI show in Harrogate, 3 - 6th Sept, date for the diary but no details yet. Looks like it may be a fabulous event. If you are interested in going as a group please let us know. Hope you have had a great month. I have enjoyed sledging in Lyme Park. Nothing like doing something that brings the giggles and thrills. Last week, I had the pleasure of seeing a carpet of snowdrops under gorgeous sunshine. Total contrast but wonderful all the same. Those who will be away next week have a super time wherever you get to. Well it's been a busy month with renewed membership, new members, discussing new events and looking at our web site ﻿AND FINDING A NEW VENUE FOR THIS MONTH!﻿ Just a reminder that we will be at Wilmslow United Reform Church on Chapel Lane. We are really looking forward to this month’s speaker - Terry Webb from Hearing Dogs for the Deaf. I am sure it will be very interesting and a thought provoking talk. I really appreciate that members wishing to re-join have done so and other members no longer wishing to continue their membership have let me know and have provided some great feedback. Other ladies are unable to commit and we wish them all the best for the future - we may well see them again from time to time. We have been able to offer an additional seven ladies places which have been taken up from our waiting list. A very big welcome to those. Our Events Table was very successful last month and we will continue this in future months. Just head over to see the ladies there to have a look what's happening in the next few months and get signed up. Some events have maximum numbers so it's worth letting me know by email if you can't attend the meeting. Also, Pauline Handley, our Secretary writes up the minutes for each meeting. This month we will be posting them in the hall in case you missed the last meeting for you to read. Let us have your feedback if you think this is useful? A huge 62% voted which was fantastic as we were so near the closing date. Next year, I hope I will be able to give you a bit more time. We had a great spread of votes so maybe we can look at some of the resolutions which we felt strongly about and do something locally. We are definitely open to supporting our local and wider community in our own way.Please let me know if you would like to put a local charity forward for support? Individual letters have been sent out regarding the New Members Evening. If you haven't received one but would like come please put your name down. Anyone is welcome and you don't need to be a new member just someone interested in meeting new people. We had a few great events over the last month including a lovely winter walk around Lindow led by Jane with 12 ladies, 1 man and a dog called Harry! Also the book club, with 13 ladies turning out on one of the coldest and snowy nights of the year so far, was a credit to them all for getting there. A great conversation was led by Anne Kerr. For those of us needing a little help with their IPad 's we were given some great tips by Diane Atkinson accompanied by great cakes from Jane! Just today, 22 ladies had a fascinating talk and tour with concert at Chethams. It’s an amazing place and it was truly wonderful. Thank you to any members who contribute to making such events a great success. If you are looking for another book to read - our next one is An Unusual Job for a Woman - PD James. We will meet on the Thursday 12th March at the Riflemans discussions to be led by Janice Simms. The bra bank will be in the hall again in aid of Against Breast Cancer. Last month resulted in 118 bras being donated! Fabulous. Please keep them coming. All donations gratefully received in any condition. Ask your friends too. 1. New members evening to be held at the Old Dancer in Grove Street on Monday 23rd February. Drinks and conversation. 3. Bel Mooney & Ernie Rea in conversation – Friday 6th March at 7.30 at St Philip & St James, Alderley Edge. In aid of the spire appeal. £15 for prosecco and canapés. 5. Afternoon walk starting at 12.30 pm on Thursday 12th March again at the Riflemans – led by Jane. 7. Another opportunity to attend the iPad course – new ideas or bring your own questions again from Diane –Tuesday 24th March at 7.30 pm. 8. Our first bike ride of the year must mean summer is on its way! Wednesday 1st April at 12.30 meeting at the Kings Arms, Alderley Road, Wilmslow, SK9 1PZ. Where will Jane take us this time? Don’t worry we will have evening ones too. 11. Adlington WI has secured Cinemac in Macclesfield for just £5 for the live streaming of the Centenary broadcast at the Royal Albert Hall - Thursday 4th June between 10.30am – 4.30pm. Three fabulous speakers have been announced - Lucy Worsley, Helena Morrissey and Tanni Grey-Thompson. It will be great to be part of history and celebrate with other WI branches. Put your name down to secure a place. 12. Gareth Malone with the Youth Choir in Monday 7th December 2015 at the Bridgewater Hall. Please register interest as will need to book early. This is the last call for names before tickets are bought. 2. Cheshire Show 2015 23 -24th June at Tabley. Entries requested from all WIs for craft and cookery competitions etc. Entries to be in by 10th April. Refreshment stalls and stewarding to be manned by the WI. Car parking and free entry in return for time helping. 3. Cheshire Federation of WIs: 95th Birthday celebrations at Gawsworth Hall, Wednesday 8th July from12.30pm. Hall & grounds & tea room open. WI members to perform (if they have volunteered already). Notice for request for tickets to follow. 1. Advance notice of the WI show in Harrogate. 3 - 6th Sept. date for the diary but no details yet. Looks like it may be a fabulous event. If you are interested in going as a group please let us know. I trust that you have all had an excellent break and enjoyed the festivities. It's a great season for catching up with people isn't it? All the best for 2015 and I am really hoping that it's going to be full of good health, lots of happiness and great fun for everyone of you. I hope you all enjoyed the Christmas party. There were lots of very lucky ladies. Hopefully you loved your hampers and secret Santa's too. Thank you so much for the fabulous donations. There is a change of speaker this month – Rachel Flynn from Pro-Fitness has kindly stepped in due to a cancellation. Thank you so much for all of you who brought your cheques. We really appreciated it and it's meant that Jennie could get ahead with the receipts. If you still intend to join could you ensure your cheques are handed in at the January meeting to ensure a guaranteed place? If you are interested in attending any of the forthcoming events please pay the deposit or ticket price or even show your interest to secure your place. There will be an Events Table this month and on-going months - please take a look. There will also be a display table of our visit to Denman. We will be asking you all to vote on the resolution that you wish to put forward to Cheshire Federation. We will provide slips and information and it would be great to use our voice. If you are not attending you can let me know how you wish to vote by email. Information is in the WI Life for December if you want to look at it first. We have over twenty new ladies from October to December alone and we would like to have a special new members evening for drinks and conversation on the 23rd February – 7.30 onwards. We will be sending individual letters out, however, if you feel you would like to attend as a relatively new member or as an existing member who would like to meet other people please put you name down. Anyone will be welcome. I had a lovely meeting with Clare the head teacher of Fulshaw Primary School. We are extremely lucky to have the use of the school hall. It would be lovely to support the school and there are a few projects that I think we can help with which I will let you know about in due course. An issue was brought to me by one of our ladies with regard to the outside lighting at the school. The lights switch off at 10.30 and that did mean that at the last couple of meetings some ladies found they were in darkness. Please come and speak to a committee member if this occurs again and we will help you out on the night. If anyone has any issues with regards to our facilities please feel free to come directly to me via email. The 32 little dresses for Africa are being sent to our contact Sue Foster at Stanwick WI who will arrange for one of their members to take them with her when she delivers medical supplies next. Thank you to everyone who contributed and created such beautiful dresses. If you have read the latest book it's a corker. It's got us talking and it's an easy read if you've not had chance it worth a go. I’m looking forward to going to the Houses of Parliament in the future! Read it and you will know what I mean. And finally, please do not forget to have a clear out of your bras. The bra bank will be in the hall for the next few months in aid of Against Breast Cancer. All donations gratefully received in any condition. Ask your friends too - one of my friends gathered 38 from her drawers in ten minutes! The more the merrier. If you interested in attending any of the events below please email president@fulshawwi.org.uk or speak to someone at the Events Desk at the next meeting. 2) Book Club – 29th January – Apple Tree Yard by Louise Doughty. Meet at the Riflemans at 7.30. 7) New members evening to be held at the Old Dancer in Grove Street on 23rd February. Drinks and conversation. 10) Visit to the Garrick Theatre, Altrincham, to see ‘Stepping Out’ 28th April - £14. Organiser Amanda Stevens. 1) Annual Council meeting, Tuesday 3rd Match at the Lifestyle Institute, Winsford. 11.00 am- 3.30 pm. Guest speaker the High Sheriff of Cheshire, Mrs Susan Sellers. Take a packed lunch and crochet cotton (if crocheting!). £10 closing date Wednesday 18th March. 3) Cheshire Show 2015 23 -24th June at Tabley, Entries requested from all WIs for craft and cookery competitions etc. Entries to be in by 10th April. Refreshment stalls to be manned by the WI. 4) Cheshire Federation of WIs: 95th Birthday celebrations at Gawsworth Hall, Wednesday 8th July from 12.30pm. Hall & grounds & tea room open. WI members to perform (if they have volunteered already). Notice for request for tickets to follow.